Are you looking for an exotic destination to visit this summer? Why not take a virtual trip to an Earth-size planet beyond our solar system with NASA's interactive Exoplanet Travel Bureau? We live in a universe teeming with exoplanets, or planets outside our solar system. Unfortunately, even the nearest exoplanets are light-years away, so sending spacecraft and humans to these intriguing worlds remains a distant dream. But on NASA's Exoplanet Exploration website, you can explore an imagined surface of an alien world via 360-degree, interactive visualizations. As you investigate each planet's surface, you'll discover fascinating features, like the blood-red sky of TRAPPIST-1d, or stand on a hypothetical moon of the massive planet Kepler-16b, which appears larger than either of the planet's two suns. The view from each planet's surface is an artist's impression based on the limited data that is available; no real photos of these planets exist. The newest planet to feature this 360-degree surface visualization is Kepler-186f, an Earth-size planet orbiting a star much cooler and redder than the Sun. 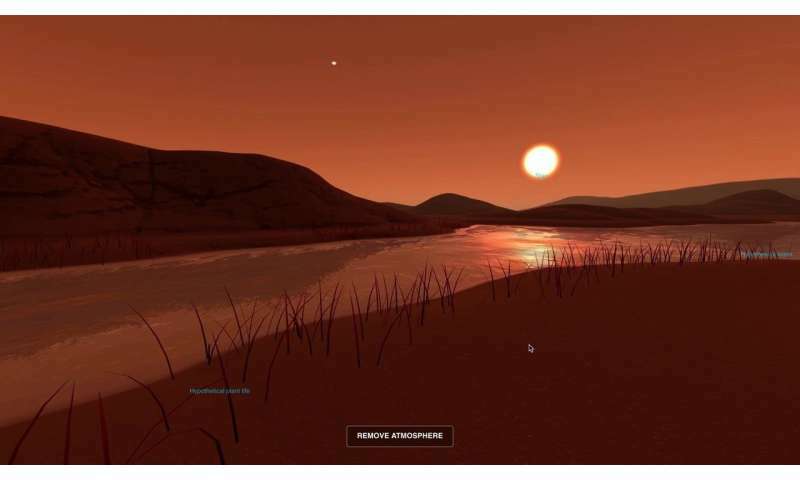 Scientists don't know if Kepler-186f has an atmosphere, but with the NASA visualization tool, you can see how the presence or absence of an atmosphere would change the view of the sky from the planet's surface. Many of the exoplanets featured on the Exoplanet Exploration website were discovered by NASA's Kepler space telescope. "Because Kepler-186f and the majority of Kepler-discovered planets are so distant, it is currently impossible to detect their atmospheres—if they exist at all—or characterize their atmospheric properties," said Martin Still, program scientist for NASA's newest space-based planet-hunting observatory, the Transiting Exoplanet Survey Satellite (TESS). "Consequently, we have limited knowledge about what these distant worlds are really like, but these surface visualizations allow us to imagine some of the possibilities," Still said. "Current and future NASA missions, including TESS and the James Webb Space Telescope, will find the nearest exoplanets to our solar system and characterize their atmospheres, bridging the gap between speculation and what's really out there." All the 360-degree visualizations are viewable on desktop and mobile devices, or in virtual reality headsets that work with smartphones. You can also peruse travelposters of such distant worlds as Kepler 186f; TRAPPIST-1e, or PSO J318.5-22, where the "nightlife never ends" because the planet doesn't orbit a star, but is instead floating freely through space. Many exoplanets share characteristics with the planets that orbit our Sun—some are gaseous like Saturn and Jupiter, while others are rocky like Earth and Mars. But these alien worlds also have unique features that set them apart. NASA is helping scientists discover and learn about these alien worlds with multiple telescopes and observatories, both on the ground and in space. For even more information and visualizations of these alien worlds, check out NASA's Eyes on Exoplanets mobile app. The Exoplanet Travel Bureau was developed by NASA's Exoplanet Exploration Program communications team and program chief scientists. Based at the agency's Jet Propulsion Laboratory in Pasadena, California, which is a division of Caltech, the program is NASA's search for habitable planets and life beyond our solar system. The program develops technology and mission concepts, maintains exoplanet data archives and conducts ground-based exoplanet science for NASA missions.